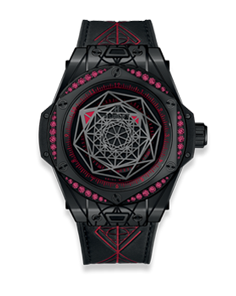 It is a model realized in collaboration with the tattoo artist Maxime Buchi, who decorated the dial, the bracelet and the case of geometrical shapes. Although many models have been created it is a popular collection that counts fans around the world. 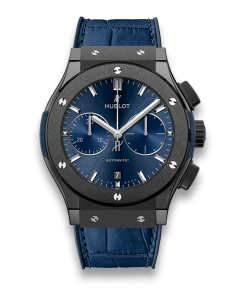 In addition to the ‘Hublot Big Bang Click Sang Bleu All Black Red’ (465.CS.1119.VR.1202.MXM18) set of 48 rubies that was this time presented, it exist with a bezel set with black diamonds, blue sapphires or pink sapphires, all 4 out at the same time. 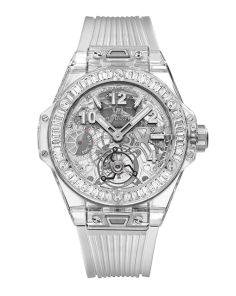 This rare model is limited to 100 pieces in the world.